3 bedrooms. 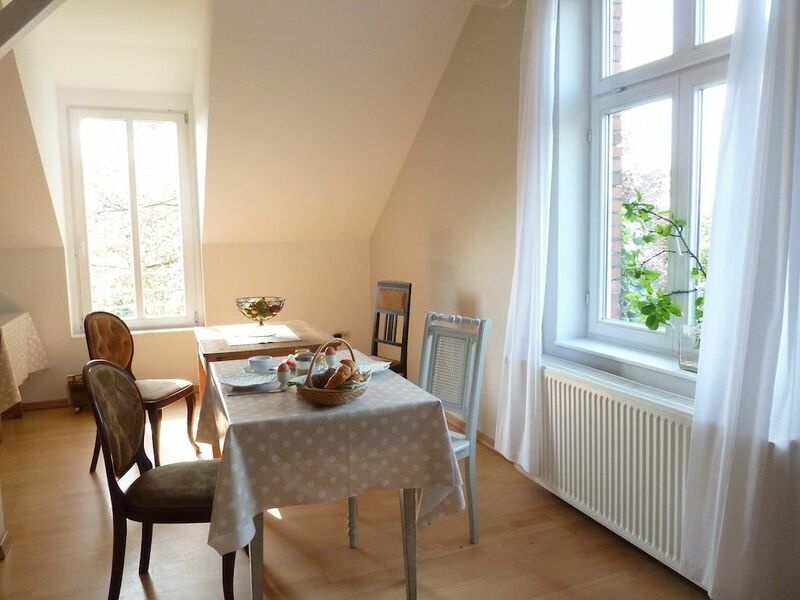 Large eat-in kitchen, apartment has a total of 125 sqm. Haus Elbgold is located in Hamburg on the Norderelbe in a rural area, but is only 10 km away from Rathaus and Jungfernstieg. The 125 square meter apartment has six beds in three bedrooms. Two additional sleeping accommodations are in a loft above the kitchen. The center of the house Elbgold is the 35qm large kitchen. The kitchenette has a new functional stove with 4 ceramic hobs and an oven with top / bottom heat, hot air and grill. There is also a modern, new dishwasher. Coffee maker, toaster and a large fridge freezer complement the amenities. Cooking utensils are abundant, so that a meal can be prepared together. In the kitchen with Wi-Fi and cable TV, there are 8 dining seats. The bathroom is a full bath with shower, bath and 2 toilets, one of which is separately accessible. There is also a washing machine and a tumble dryer. Also for toddlers is provided with 2 high chairs and 1 cot. The house has a beautiful, spacious garden. The use of the garden is allowed, there is a barbecue with seating. Also bicycle parking spaces are available in a separate bicycle shed. Washing machine and dryer available. 1 WC can be locked separately. We stayed here for 3 nights to visit Hamburg. A nice quiet place as if you're on the country side although it's only a 15 min drive from the center of Hamburg. This is a really big APP (half of the house), very well equipped and maintained, in a very beautiful place, you don't get any feeling that your are near the big city, seems like a farmland. I would certainly recommend this APP, especially to a large families (as we were). By my opinion APP only lacks infrastructure around the APP. We didn't find any grocery shops nearby (the owner said that there is one 3 minutes drive away, but I could not find it, which was probably my fault:-) and probably the best solution to go to the city (and for the groceries) is by using car and park by the nearest U bahn station (being Billwerder Moorfleet that has enough free parking spaces and is 15 minutes drive away), although you can walk to a bus station 1,4 km away. We were OK with that because we knew that in advance. Wir waren mit 8 Erwachsenen für 4 Tage in Hamburg und haben uns sehr wohlgefühlt im Haus ELBGOLD. Das Haus ist sehr gemütlich, die Küche war voll ausgestattet, sodass wir auch mal zum Abendessen nicht rausfahren mussten, sondern haben selbst gekocht und die ruhige Lage genossen. Die Vermieterin ist sehr hilfsbereit und hat uns während der Zeit bei Bedarf gut weitergeholfen. Die Lage ist optimal. Mit dem Auto ist man ganz schnell in der City, aber man freut sich auch auf das zurückkommen und hat den Parkplatz gleich vor dem Haus. Ideal für Familien mit Kindern. Waren mit 6 Erwachsenen und 2 Kleinkinder. Alles super, uns hat nichts gefehlt, sogar Waschmaschine, Trockner und Kinderhochstühle vorhanden. Fahrt mit Auto nach Hamburg ca. 20 Minuten. Delightful country feel right next to the big city with beautiful garden views out each of the many windows. What a great spacious, clean and welcoming place. The kitchen had enough resources to make all our meals and we all enjoyed enough personal space and together space. Lots of windows provided great light and fabulous views of a wonderful garden. Owner was very helpful with all our needs and we had a delightful stay. Our only small challenge was finding a grocery open later when we arrived, simply keep this in mind when planning arrival and come with supplies if arriving later. Plenty of free parking. We would love to stay again and all enjoyed the hospitality, comfortable rooms, the wonderful location and atmosphere. The house Elbgold is located in a rural area, but close to the city. A car is advisable because shopping facilities are located about 5 km away.